Treatment Drugs of Type 2 Diabetes Shacketine is a type 2 diabetes drug that can stimulate the pancreas to produce more insulin after the meal. It was reached by the cooperation of AstraZeneca and Bristol-Myers Squibb Company and belongs to DPP-IV inhibitor. It plays the role through inhibiting GLP-l degradation. GLP-I is the hormones naturally produced in the intestine after taking food. It can regulate the secretion of insulin and strengthen the utilization of glucose in the peripheral tissues. The single medication of Shacketine can improve blood glucose control and the combined medication of Shacketine with metformin, sulfonylurea and thiazolidinediones can enhance curative effect. It leads to low risk of hypoglycemia and its adverse reactions are similar to placebo, showing better tolerance. On July 31, 2009, Shakleitine tablets (Onglyza), a new drug of type 2 diabetes, jointly researched and developed AstraZeneca and Bristol-Myers Squibb was approved by the US FDA. It can be taken once a day to treat type 2 diabetes combined with controlling Diet and exercise. The most common side effects are upper respiratory tract infections, urinary tract infections and headaches. And other side effects include allergic reactions, such as rash and urticaria. Market and Risk Saxagliptin (rINN), previously identified as BMS-477118, is an oral hypoglycemic (anti-diabetic drug) of the dipeptidyl peptidase-4 (DPP-4) inhibitor class of drugs. Early development was solely by Bristol-Myers Squibb; in 2007 AstraZeneca joined with Bristol-Myers Squibb to co-develop the final compound and collaborate on the marketing of the drug. In June 2008, it was announced that Onglyza would be the trade name under which saxagliptin will be marketed. In April 2016, the U.S. FDA added a warning about increased risk of heart failure.This was based on data in an article that concluded "DPP-4 inhibition with saxagliptin did not increase or decrease the rate of ischemic events, though the rate of hospitalization for heart failure was increased. Although saxagliptin improves glycemic control, other approaches are necessary to reduce cardiovascular risk in patients with diabetes." Saxagliptin is used as monotherapy or in combination with other drugs for the treatment of type 2 diabetes. There is no evidence to decrease the risk of heart attacks or strokes.It increases the risk of hospitalization for heart failure by about 27%. Like other DPP-4 inhibitors, it has relatively modest HbA1c lowering ability, is associated with a relatively modest risk of hypoglycemia, and does not cause weight gain. 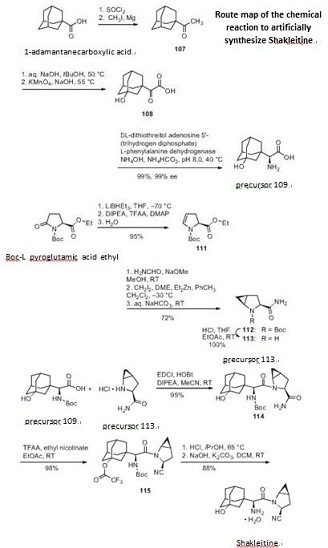 Synthesis Method First synthesize the precursor 109 from 1-adamantanecarboxylic acid and then synthesize the precursor 113 from Boc-L pyroglutamic acid ethyl ester. Finally synthesize Shakleitine from 109 and 113. Figure 1 the chemical reaction of synthesizing Shakleitine. Uses Saxagliptin is a potent and selective reversible inhibitor of dipeptidyl peptidase-4, which is being developed for the treatment of type 2 diabetes. It is absorbed rapidly after oral administration an d has a pharmacokinetic profile compatible with once daily dosing. Definition ChEBI: A monocarboxylic acid amide obtained by formal condensation of the carboxy group of (2S)-amino(3-hydroxyadamantan-1-yl)acetic acid with the amino group of (1S,3S,5S)-2-azabicyclo[3.1.0]hex ne-3-carbonitrile. Used in its monohydrate form for the treatment of Type II diabetes.